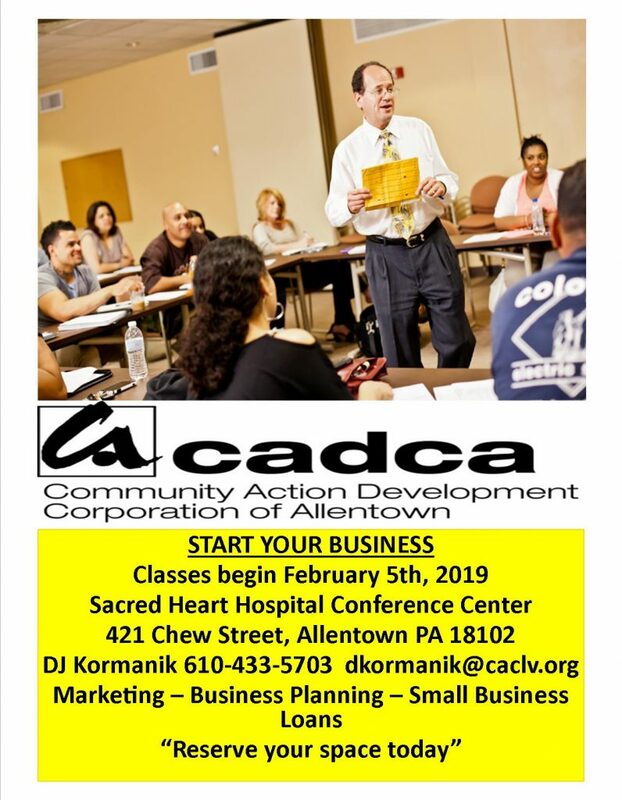 Community Action Development Corporation of Allentown (CADCA) provides entrepreneurial skill training to prospective and existing business owners through our Start Your Business course. The Start Your Business program is designed to guide individuals through the process of starting and operating a successful small business. Our program has been developed to help the starting entrepreneur or the existing business owner. We provide four courses that are held once a week for four weeks in a row. You have the ability to take all four courses or just one. The series includes instruction on financial planning, marketing and sales, accounting, tax preparation, and networking in addition to basic business skills. Local successful business owners and experts assist in presenting and strengthening course material as students are guides through the process of writing a business plan. During the program, you will work with CADCA staff on a one-on-one basis to assist you with writing a business plan and preparing for your business. Existing or prospective entrepreneurs in Allentown or the Lehigh County can take advantage of CADCA’s direct business training opportunities through one on one technical assistance. Services include credit score improvement, marketing and the opportunity to apply for a micro-loan from the Rising Tide Community Loan Fund. To schedule an appointment with the Business Development Director, call 610-433-5703.